April is a double swap month for the Around the Block swap, and I am ensuring I keep up with the pace. 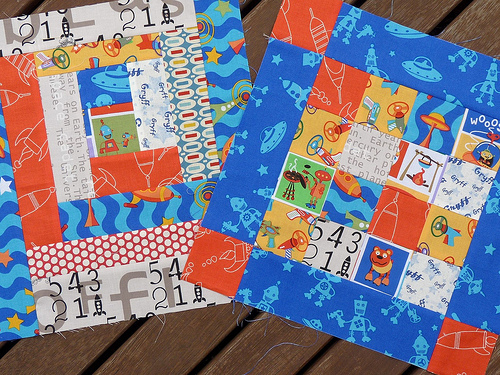 Rachel (Four Wise Monkeys) sent a parcel of Riley Blake fabrics to be made into blocks for quilts for her boys. Rachel asked for blocks featuring bold colors and simple shapes. Susie (Yarnplanner) on the other had an Astronomical theme with fabrics to match. 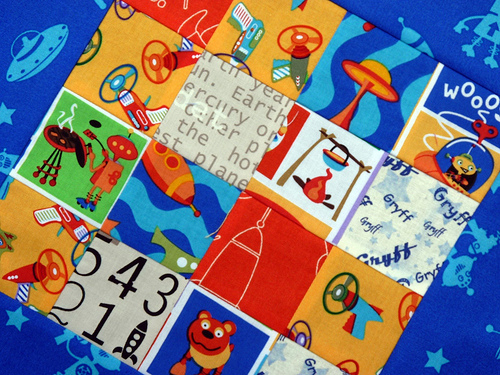 Susie's blocks are to be made into her quilt for her young son and asked for each block to include a small piece of Spoonflower fabric with Susie's son's name - Gryff. I really enjoyed using these fun fabrics and simple piecing. Thanks fellow swappers - your blocks are in the mail. Love those Riley Blake blocks!!! Thanks Rita! Fantastic blocks and my boys are going to love opening all these packages. Just love them! 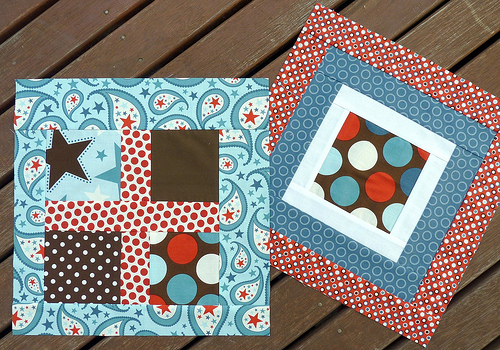 These quilts are going to be very different but both lots of fun!! I would love to know the measurements for the Riley Blake block on the right. Are those 12.5" blocks? I have a bunch of half-yards of that fabric in a different colorway sitting around waiting for me to make it into my son's quilt! Great blocks Rita - they are all stunning!